Find right size paddle board for you. When choosing a paddle board size you want one that has enough volume (buoyancy) based on your weight and experience level to keep you properly afloat. Use the below paddle board size chart broken down by SUP model, characteristics, suggested weights and volumes for each board. 4 1/4" | 4 1/2"
7 1/3" | 7 1/2"
4 1/3" | 4 1/2"
Most SUPs are between 10-11 feet and 32-34 inches wide. Width will determine how stable your board is, however the wider your board, the harder to paddle. Shorter length boards are primarily used for racing and are easily maneuverable. In addition to height and weight, the board thickness also matters. The weight capacity of SUPs varies by type and model. It’s important to note that you cannot be too light for a stand up paddle board! As long as your weight is at or below the suggested weight limit, you should be fine. However, you don’t want to be too heavy for a board. When the paddler is heavier than the board’s weight capacity, the board will ride lower, dragging in the water and making in inefficient to paddle. 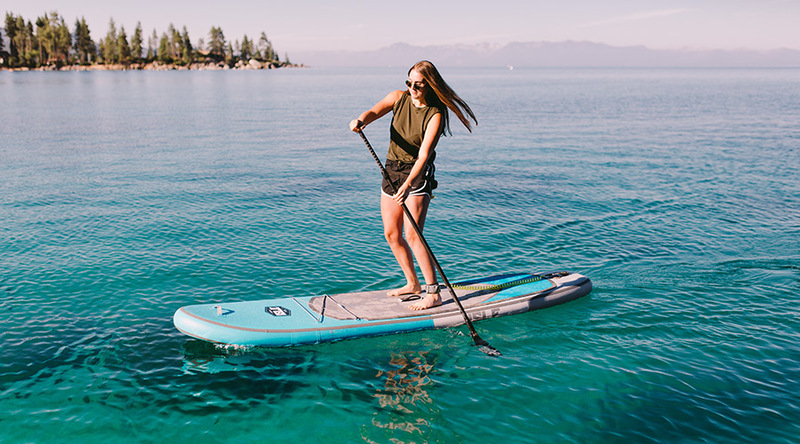 If you are new to paddle boarding, you want to make sure the SUP you get can support your weight and is super easy to balance on while paddling. Please know that if you plan to go paddle boarding with your dog, kids, friends or significant other, please make sure to consider their weight into the simple equations below. Also consider any gear, food or water you’ll carry on board with you. If you are an intermediate to advanced paddle boarder and are considering on purchasing a step up to your last SUP, use the equation below. We did not include an equation for inflatable paddle boards because most inflatable SUPs are for all skill levels (beginner – advanced). Inflatable paddle boards are great for flat water paddling and are easy to take with you. Thin, 4 inch inflatable boards are good for children or very lightweight paddlers, but are not recommended for others due to the potential “taco effect”. Also known as rigid boards are great for surfing and touring. With the right size epoxy paddle board, you can effortlessly glide through the water. The general rule of thumb when determining what size stand up paddle board is right is to add 9-10 inches to the height of the paddler. In addition to the height, consider the weight of the paddler, their experience, and where they will paddle. It’s important to note that the height rule of thumb varies depending on the primary use of the SUP. 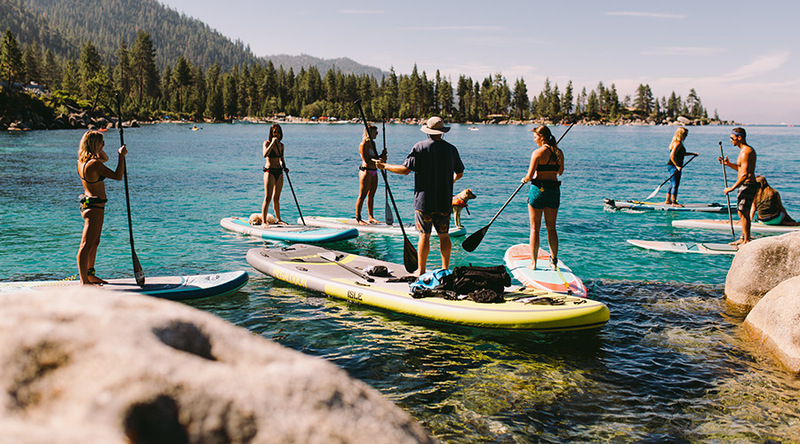 Paddlers looking for touring stand up paddle boards generally choose a board that is slightly longer than the average, 10-12 inches taller than the rider. An epoxy board is lightweight, rigid, and glides through the water making it the perfect choice for racing. In addition, racing SUPs are typically narrower making them fast but less stable. if you’re looking for a stable SUP that can be used for yoga or flat water paddling should choose a board with a wider surface area for additional stability. For yoga paddle boards, look for boards with a comfortable deck pad similar to your yoga mat. The ideal size SUP for catching some waves is typically shorter than the average 9-10 inches. To ensure they are easily maneuverable opt for a board that is 6-7 inches than your height. Although most surf SUPs are hard boards, inflatable SUPs are a great option for easy transportation. If you’re new to paddle boarding, stability is mostly likely a key factor in what type of SUP you choose. Most beginners opt for an inflatable SUP board which has a uniform thickness from the nose to tail which helps paddlers better balance their weight. Use our SUP Beginner’s Guide to learn how to paddle board.